After serving as president for five years with the National Association for the Advancement of Colored people (NAACP), Benjamin Jealous will be stepping down from the position. The announcement came Sept 9. through a conference call with NAACP Chairwoman Roslyn Brock. Jealous has expressed interest in spending more time with his family, which was one of the two promises he made when he took the position in the beginning. The other promise was to help strengthen the NAACP, which he has done. The son of a Black, retired psychotherapist and author, Ann Todd Jealous and White, civil rights activist, founder and president of the Breakthrough Men’s Community, Fred Jealous, you could say achieving great things runs in the Jealous family blood. Born in Pacific, Grove, California, Jealous grew up in Monterey, Peninsula, California. He attended Columbia University where he received his B.A. in political science and master’s degree in comparative social research from Oxford University as a Rhodes Scholar. 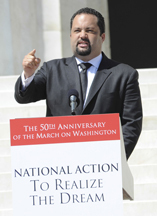 Jealous’ history with the NAACP began at Columbia University when he worked with the NAACP Legal Defense Fund. He became very active with the association in addressing issues relevant to the Black community. Later he would join the Black Press working as a reporter at the Jackson Advocate in Mississippi. Jealous covered investigative stories exposing corruption and wrongfully accused parties. He would later become the executive director of the National Newspaper Publishers Association (NNPA), which is made up of 200 Black community newspapers. Jealous is responsible for NNPA.org, the online syndicated news service, which send its content to NNPA member papers. Jealous’ attention to human interests and hard-hitting issues would continue when he took on the position as director of the US Human Rights Program at Amnesty International. There, he addressed issues such as prison conditions, racial profiling and youth sentencing practices. He would also accept the position as president of the Rosenberg Foundation, a nonprofit organization. Jealous was elected as president of the NAACP in 2008 and was the youngest to serve in that position. His passion for addressing issues important to the Black community didn’t stop during his time with the NAACP. Jealous would open national programs addressing criminal justice, health, environment and voting, education and banking issues. His accomplishments include doubling the annual revenue of the NAACP from $23 million in 2007 to $46 million in 2012. Donors to the NAACP also grew from 16,000 to 132,000 over that same period of time. According to Jealous, the NAACP has a greater presence with (1.3 million) activists online and on mobile devices (more than 430,000) than any other civil rights organization. Jealous is responsible for bridging networks with other groups during his tenure. In 2010, the NAACP led protestors, from multiple groups, under the umbrella of the One Nation Working Together Rally to protest issues like stop-and-frisk policing in New York City. Over the course of the past three years, he has started initiatives such as the Democracy Initiative to addressing money in politics, voting rights and reformation in Senate, worked with Tea Party members on criminal justice reform and addressed immigration. In 2009, Jealous received the John Jay Award for his achievements at Columbia University. He has been named in various lists including Time Magazine’s “40 Under 40” rising stars of American politics in 2010, “Power & Influence Top 50” list, Fortune Magazine’s “40 Under 40” in 2012 to name a few. Leon Jenkins, president of the NAACP Los Angeles Branch, commented on Jealous’ departure as president of the NAACP. He spoke highly of Jealous’ accomplishments and in the qualities the next president needs to embody. “He has served the NAACP very well for five years,” said Jenkins. “Our membership has increased, I believe, over 100,000 people since his time there. “He is going to be sorely missed—I just hope the next person we get shares some of the values that are very close to the NAACP and has a charismatic presence. Al Sharpton, president and founder of the National Action Network, had mixed emotions when he received news that Jealous would resign from the NAACP. Ron Daniels, president of the Institute of the Black World 21st Century, a group working to empower Black communities economically and politically, stated that Jealous brought new energy to the NAACP with gifted and talented youth. “The NAACP has always been the largest civil rights organization in the streets, and today it is also the largest civil rights organization online, on mobile and at the ballot box too,” said Jealous. “I am proud to leave the Association financially sound, sustainable, focused, and more powerful than ever. Beginning next year, I look forward to pursuing opportunities in academia to train the next generation of leaders and, of course, spending a lot more time with my young family." Jealous can leave the position knowing that he made great strides for the NAACP during his tenure. Now he that he’s fulfilled his first promise, no doubt he will accomplish his second promise to spend more time with his children. Jealous resigns Dec. 31. Freddie Allen, NNPA Washington Correspondent, contributed to this article.